Arriving in ever increasing numbers during the last decades of the nineteenth century, Jewish immigrants to America did not find the Jewish ambience of the shtetl (small town) in the Jewish sections of the larger cities. To compensate, many made their homes as visibly Jewish as possible with religious prints and lithographs. In 1874, the H. Schile company on New York's Lower East Side published three lithographs for the Jewish trade. A mizrach, an ornamental sacred picture placed on the east wall of a home for daily prayers directed toward Jerusalem, was preserved as issued, a black-on-white lithograph. 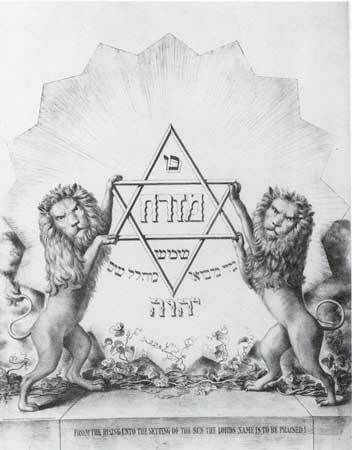 Two lions which have human faces hold up a star of David in and about which is inscribed in Hebrew the verse most often found on a mizrach, "From the rising [East sun] unto the setting of the sun the Lord's name is to be praised!" (Psalms, 113: 3). At the bottom as the title of the print, the verse is printed in English. All prayer is oriented eastward, toward Jerusalem. To point the direction, a mizrach is hung on the eastern wall of the house. This one, published by H. Schile Company, is a lithograph, black on white, or which color could later be added by hand. Mizrach, New York, 1874. Prints and Photographs Division. The other two lithographs are of Moses and Aaron. These have come down in their completed state, hand-colored in bright hues. 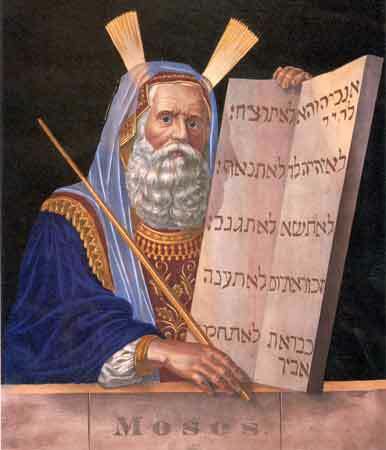 Moses, in rich garb, a prayer shawl draped over his head and shoulders, holds the tablets on which the Ten Commandments are inscribed in Hebrew. Aaron, in ornate priestly vestments, holds a censer. Inscribed in Hebrew is the biblical verse, "And they shall make holy garments for Aaron thy brother, and for his sons" (Exodus, 28:4). Published as a black on white lithograph by the H. Schile Company of New York, the color added by hand, Moses, with a tallith (prayer shawl) on his shoulders, holding the Tablets of the Ten Commandments, would have been welcome in many a nineteenth-century American Jewish home. Moses, New York, 1874. Prints and Photographs Division. The inscription in Hebrew makes this brightly colored lithograph of Aaron appropriate for the walls of a Jewish home. Produced by the H. Schile Company. Aaron, New York, 1874. Prints and Photographs Division. The Lord hath given: Man comes out of the womb, his hands clasped, as if to say: All the world is mine, I will besiege fortified cities, amass the treasures of king without measure. The Lord hath taken away: Man returns to his eternal home with hands spread open, as if to say: Naked I return there, nothing can I take with me. Neither possession nor great wealth will avail in the day of trouble and reckoning. At the top, two putti angels aloft hold a banner which, in Hebrew wit] English and German translation, bears the legend, "A good name is better than good oil and the day of death than the day of birth" (Ecclesiastes 7:1). This Gedenkblatt or Memory Tablet "for dear and de parted ones" in three languages, German, Hebrew, and English, leaves space on the pages of the open book to record the names and dates of death of the dear departed, so that their presence might remain in the home on whose walls this tablet would be hung and their Yahrzeit observed. Published by A. M. Bleichrode. 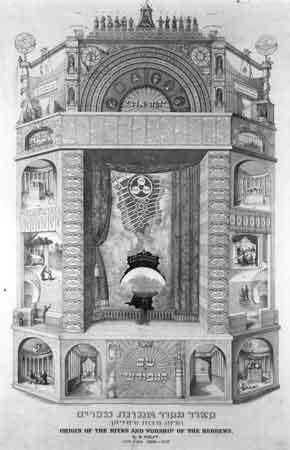 Gedenkblatt (Memory Table[t]), New York, 1874. Prints and Photographs Division. 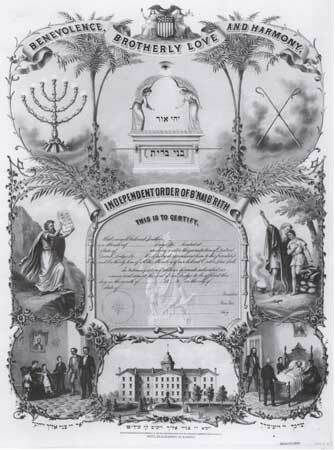 Two years later, in 1876, S. Eckstein published a beautifully illustrated Independent Order of B'nai B'rith membership certificate, lithographed by the American Oleograph Company of Milwaukee. 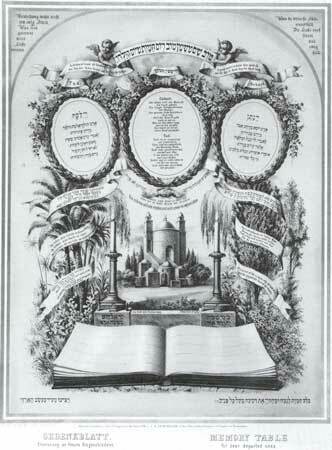 B'nai B'rith, organized in New York in 1843, was the first Jewish fraternal order in the United States. By the end of the century it had lodges throughout the world, including Jerusalem. it not only served the needs of its members, but increasingly engaged in communal service endeavors. Its orphan asylum in Cleveland, for example, set standards rarely equaled. The Eckstein certificate depicts both the Order's Jewish heritage and its benevolence. At the top, under a crest of an eagle astride an American shield of stars art stripes, flanked by the ladies Liberty and Justice, is the motto: "Benevolence, Brotherly Love and Harmony." Beneath, angels on the altar, a seven-branched menorah (candelabrum), and crossed shepherds' crook! Four panels depict Moses with the Tablets of the Commandments and Abraham and Isaac above, and below, a doctor visiting a sick brother, and lodge brothers calling upon a bereaved widow and orphans. At the bottom is the Cleveland Orphan Asylum and, in Hebrew, the priestly benediction: "The Lord bless thee, and keep thee; The Lord make his face to shine upon thee, and be gracious unto thee; The Lord lift up his countenance toward thee, and give thee peace" (Numbers, 26:24-26). A member of B'nai B'rith, America's oldest and largest Jewish fraternal order, could proudly display his membership certificate, whose illustrations would remind all of the order's mission, and its threefold devotion: to country-the American eagle and shield; to faith  Abraham and Isaac, and Moses at Sinai; and to fraternal benevolence  visiting the sick, consoling the bereaved, caring for orphans. Membership Certificate, B'nai B'rith, Milwaukee, 1876. Prints and Photographs Division. In Milwaukee, too, The Dying Ben B'rith: An Episode in the Yellow Fever Scourge of 1878, by A. L. Baer, was published in 1883, "Dedicated to the Asylums of the Independent Order of B'nai B'rith." In this account in verse of the Order's benevolence to the family of a brother smitten by the dread plague, what are particularly moving are Robert Schade's illustrations, none more so than a scene at the cemetery. First in B'nai B'rith's threefold mission is benevolence-brotherly love and harmony follow. A richly illustrated record of its fulfillment is The Dying Ben B'rith: An Episode in the Yellow Fever Scourge of 1878. 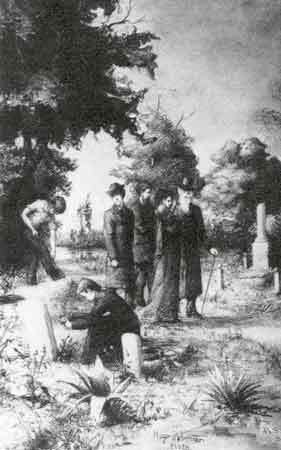 We see a visit to the cemetery, drawn by Robert Schade, from a photo by Hugo Schroeder. A. L. Baer, The Dying Ben B'rith, Milwaukee, 1883. General Collection. This pictorial representation was originally composed by the learned and accomplished Dr. Rosenberg, and by him published in Paris in the year 5611-185 1. Some two years ago  a copy ... Was presented to me.... 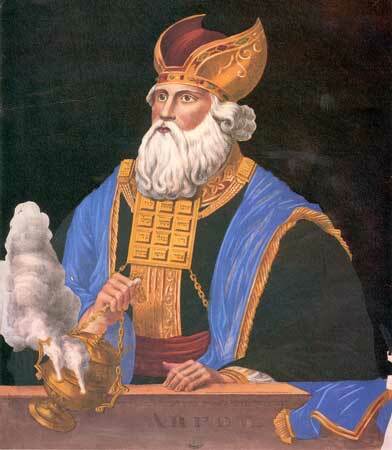 Many called upon me to explain the plan; others, again desired to possess copies with an explication in the vernacular tongue, and urged me to undertake an Anglo-American edition from the French original; and when I reflected how little the spirit and profound character of the institutions of Israel are known among Gentiles, while even among Hebrews, here, in the United States, the study of the sacred language and literature ... [and] the Talmud, is so greatly neglected ... it struck me that I would be doing a good service ... to edit and to publish. A 112 -page booklet went with this massively detailed engraving, which was so complex, filled with information, and replete with symbols of the Jewish tradition. Its publisher and author was Max Wolff, a religious functionary-a cantor in Boston and San Francisco. Max Wolff, Origin of the Rites and Worship of the Hebrews, New York, 1859. Hebraic Section.